A think-tank report on the link between inequality and social conflict in Spain has warned that increased economic polarization and social conflicts could be in store as a result of the inability of Spain’s economy to generate “stable and sufficient” employment, combined with a “very high” concentration of wealth in relatively few hands and restrictions on social spending that limit more equitable redistribution of benefits among Spaniards. 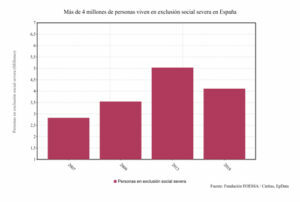 Published Thursday by the Fundación Alternativas (Alternatives Foundation), a think tank with ties to the Socialist party created in 1997, the organization’s third annual “Report on Inequality in Spain” blames structural economic problems, particularly a preponderance of low-wage employment in Spain, that are serving to shrink Spain’s middle class, put the brakes on social and economic mobility and condemn many families to live in poverty, generation after generation. 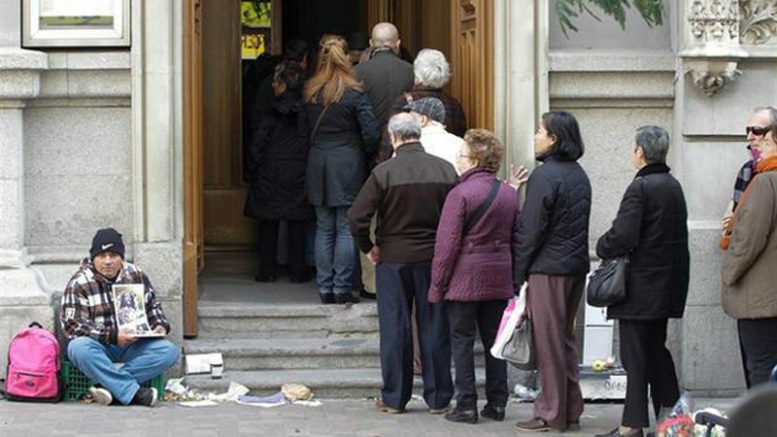 The report comes on the heels of a similar study released by the Caritas-linked FOESSA Foundation that says 4.1 million people living in 1.5 million households across Spain are experiencing social exclusion as a result of extreme poverty. That number has fallen from a recent record high of 5.03 million in 2013. But, the number of people living in extreme poverty in Spain today remains 40 percent greater than the level registered in 2007 prior to country’s economic crisis — and more than those living in extreme poverty at the height of the crisis in 2009. According to the authors of the Alternativas report, the supposition that a return to growth for Spain’s economy would lead to increased prosperity across the economic spectrum is not born out by economic statistics of the past several years.